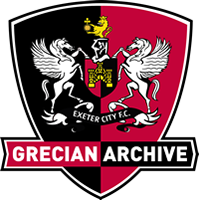 A guest player for Exeter City in 1945-46, Haddington made two outings in the Division three South (South of the Thames) for the Grecians. The first of which was against Bristol Rovers at St James’ Park in September 1945, scoring in the 2-1 win. Haddington was an amateur with Bradford Park Avenue at the time, but earned his first professional contract at neighbours Bradford City in September 1946. He made his Football League debut after signing for Oldham Athletic in August 1947, making 117 appearances and scoring 63 goals, Haddington then moved to Manchester City in November 1950 where he scored 4 league goals in 6 games. Moving on to Stockport County in December 1951, he only stayed until the end of the season, playing 11 league matches and scoring 4 goals. He then linked up with Bournemouth and Boscombe Athletic in July 1952. His stay on the south coast was a short one though, for after two appearances and three months later, he was signing for Rochdale. He added 12 goals in 38 league matches during his time at Spotland. His final Football League club was Halifax Town, moving there in November 1953, but he was released at the end of that season scoring one goal in eight league games. He then played for Bedford Town.